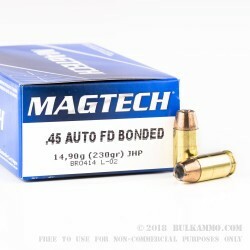 This 45 ACP cartridge from Magtech’s First Defense Bonded line of ammunition features a 230 grain projectile. A hollow point, this bullet is ideally suited for self-defense and the needs of law enforcement professionals who would depend on whopping stopping power to take down assailants fast. 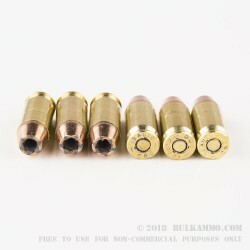 The bullet’s jacket is bonded to its lead core to provide reliable penetration, even through layers of protective fabric, and also to control the hollow point’s expansion within the target. With its 837 fps muzzle velocity, this cartridge offers the optimized energy transfer and quick expansion that you can rely on when your safety is on the line. 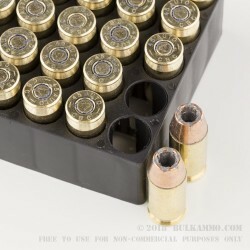 This cartridge also offers a non-corrosive Boxer primed brass casing, so you can keep reloading it for several range sessions’ worth of repeated value. 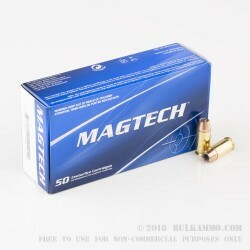 That value is only bolstered by Magtech’s fine reputation for their products’ quality, which they owe to their state of the art manufacturing processes and peerless dedication to thorough quality control.